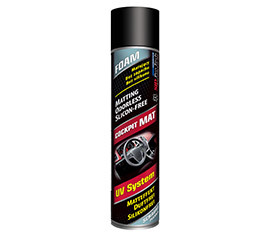 Product was created for conservation matt parts of car equipment made of plastic. Thanks to UV filters it protects the structure against loosing dyes and brings up the depth of colours surfaces. It doesn’t create sticky film and it protects against dirt. Antistatic features reduce the adhesion of dust. Special ingredients moisturize cockpits elements without shining effect and streaks. Odorless formula is designated for clients who are sensitive on strong fragrances.